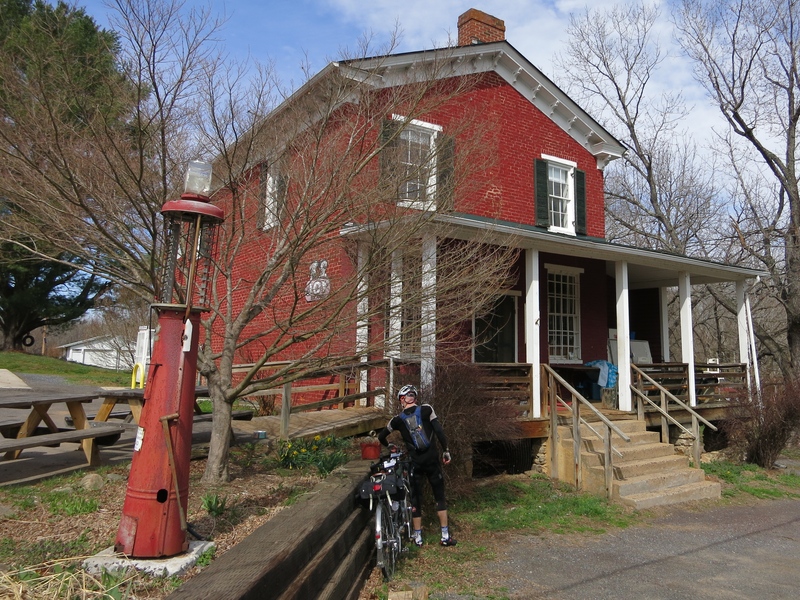 This weekend Felkerino and I hightailed it out of the city to escape the crowds that have descended on Washington, D.C., and arranged to do the lovely Old Rag 200K out of Warrenton, Virginia, with bicycling buddies Andrea and Mike. From Warrenton we head generally southwest passing through rolling horse farm country with the Blue Ridge Mountains as our backdrop. We parallel the Blue Ridge as far south as Madison where we begin our return to Warrenton after a stop at the friendly, well-stocked Yoder’s Country Market. The route is fairly gentle as we wind our way to Syria in the shadow of Grave’s Mountain. A moderate climb followed by a 3-mile descent puts us up and over the Old Rag Grinder. A series of steep and unrelenting rollers–lovingly known as The Three Kings and The Meanies–will consume us for the next hour or so prompting many to re-fuel at the Laurel Mills store with the sweet, spring water that flows nearby. Country roads bordered by stone fences carry us through Ben Venue and into Flint Hill and the final control at the reopened Orlean Store. 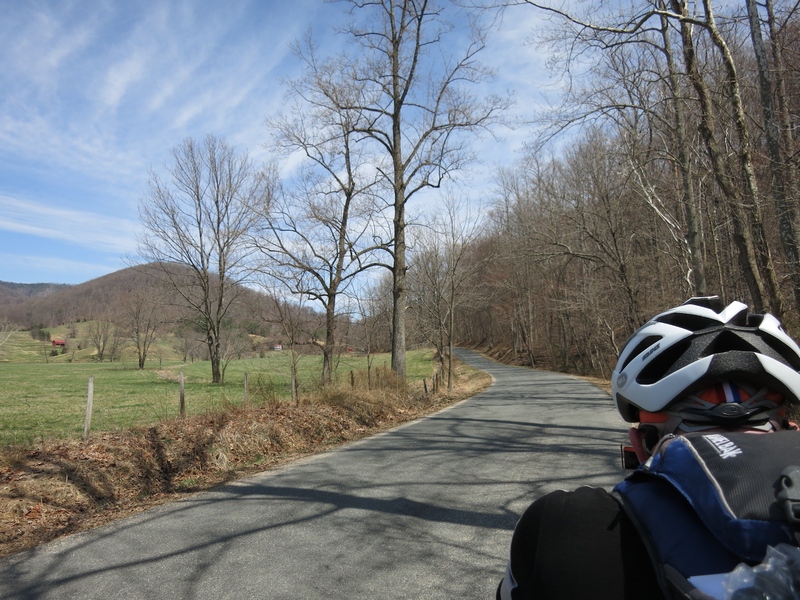 A final climb over Piney Mountain brings us back to Warrenton. Estimated total elevation gain : 8,000 feet. This course is an old friend to Felkerino and me. It was the first 200K brevet course he ever rode (in 1996), and my second (in 2005). Saturday’s temperatures were good for riding, the wind swirled around in its springtime way, and the sun shone. Felkerino and I had great company. I was glad for the urban reprieve, but unprepared for how mentally challenging this ride would prove for me. I have not been logging the bike miles like I hoped this year (although my running miles are up, woo!). Dispirited by the colder weather, getting sick on a couple of weekends I hoped to spend on the bike, blah blah blah. I’m full of good excuses, but the bottom line is that my confidence going into this ride was not where I wanted it. My mind also kept wandering back to personal concerns. I forget how the things going on in our lives can affect our energy levels and focus. Usually, I can shake stuff, but it wasn’t happening on Saturday. I’d chew on things for a while and then refocus on the ride for a bit, only to be distracted again by all the thoughts banging around in my brain. My usual mental approach to a 200K is fairly simple. 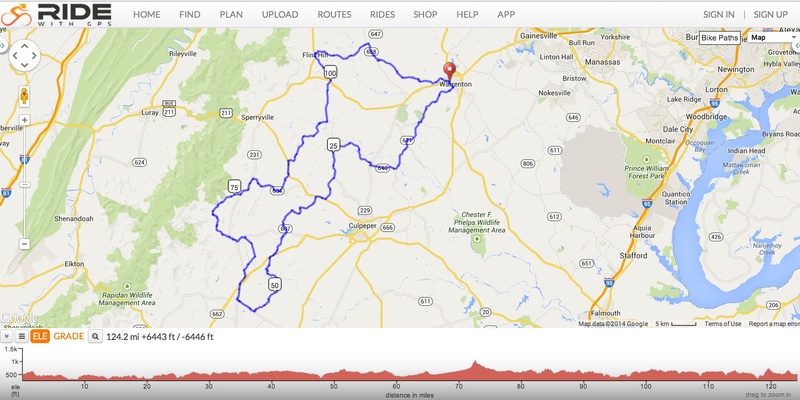 Divide the ride into two main parts, the first 60+ miles and the last 60+. Knock off the first 25 miles and get the ride down to a conceptually manageable century distance (easy peasy!). 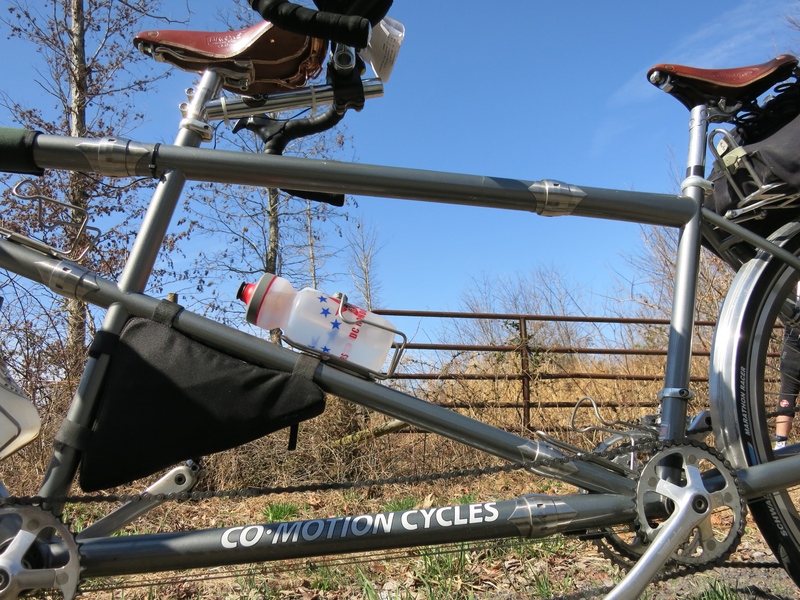 Pedal steadily with minimal breaks until the halfway point, eating out of the back-pocket cafe as needed. Eat something more substantial at the halfway mark, like a sandwich. Ride steadily from lunch and stop once more for a little snack at around mile 100 or so. Only 25 miles left (Surely you’ve ridden 25 miles before?). This ride required the use of these ride management strategies and more to push through. I rode the first half or so according to plan, but struggled mightily after the first 60 miles. It was strange because my body felt fine, but my brain wanted to be back in bed, resting on my pillow. The delicious Etlan Road is just past this red barn, and so is a steep climb. 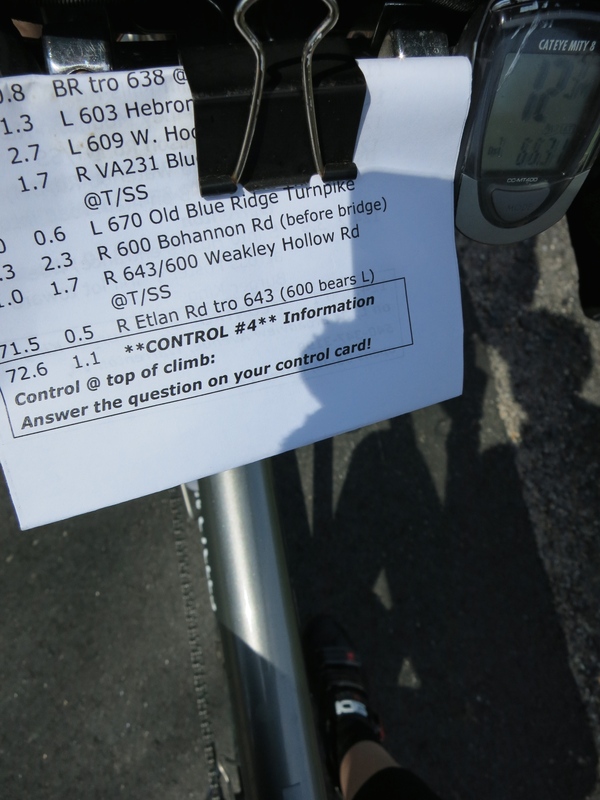 After much scrutiny of the cue sheet, I ended up breaking the ride down into 10-15 mile segments. I spent a lot of time challenging myself to basic math word problems, and compared the distances we covered to the everyday riding I do. Three rides to Whole Foods and back until we reach the next control. Two trips to work until we are at X miles. Two trips to the doctor, taking the long way. This made the distances easier to conceptualize, while also taking my mind off other things. Ride management strategy: time for math. I also rewarded myself at mile 94 with homemade monster cookies I purchased earlier in the day. I try to avoid rewarding myself with food, especially during rides. Not this ride. This ride needed a dose of monster cookies! Strangely, my legs felt decent throughout the day. At some points they fatigued (particularly during parts of what we call the three kings), but overall my physical output felt solid. It was my head that was out of sorts. I struggled to be present in the ride. I don’t know if this is worse to experience on a tandem or a single bike. On one hand, you can start to think about how you are dragging the other person down, how much faster they could go if you were not there. On the other hand, your teamwork can be a source of encouragement. Fortunately for me, Felkerino was a good tandem partner on this ride. Laurel Mills Store, where I rewarded myself by devouring monster cookies. Despite my difficulties focusing, I’m still glad we got out. I had to get away from the District. 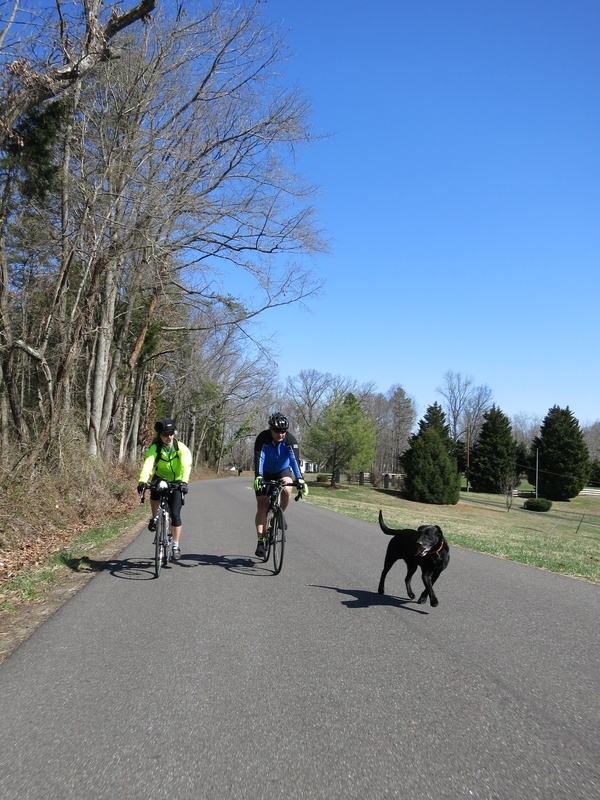 It felt good to meet up with others and pedal our way over the choppy and scenic Virginia countryside, with all of its trees poised to blossom. One day after the ride, my legs are tired, but I am far from wiped out. This ride built my confidence that we can handle hills and go further than 200K if/when we need to do so. My head was not in the space I wanted it during the ride, but I feel much better about life today. Nothing like a 200K in the spring sunshine and lots of made-up math story problems to clear the head. Thanks to Mike and Andrea for riding with us. And Felkerino, you’re the best. Hey, I don’t think I rode 120 miles this year. Even without that dubious fact in my mind I’m impressed. Sounds like great fun and an entertaining route. I’ve gotta ask, what’s in a monster cookie? They’re heavenly glory you can hold in your hand. They generally include oatmeal, choc chips, and m&m’s. That combination makes them better road fuel than your average cookie. The ones my mom makes were usually about 5″ across. They ARE glorious! Mine also had peanut butter in them. Delicious! I’ll never get over what DCRs consider “rollers”. 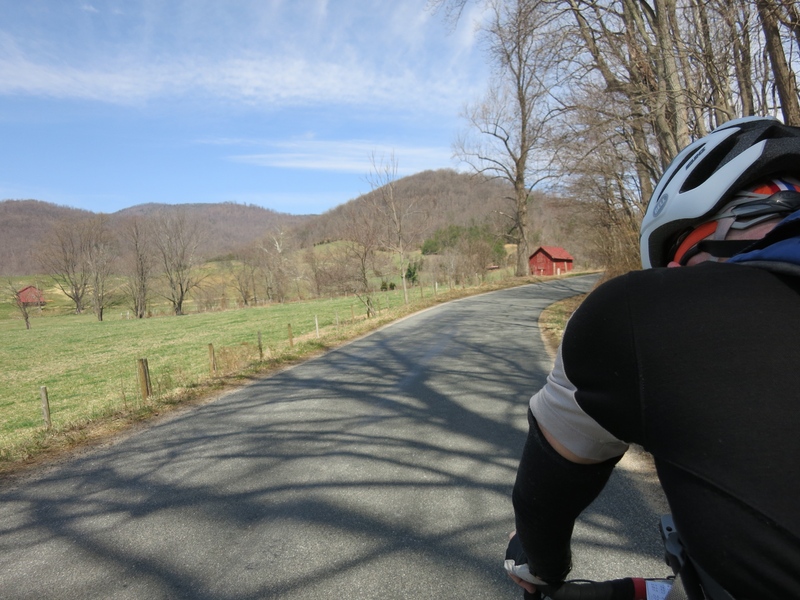 When I got to the three-kings on my first (and only so far) ride on the Old Rag 200, I had some trouble both physically and mentally. Wow! They’re more like sharp, pointy teeth. The unrelenting part was correct at least. I definitely look at ride descriptions more critically now. I like how you use hypothetical speeds. These sound like advanced math problems, though. I will have to work up to them this year!